Lettuce isn’t only for making salads, you can use it in your green smoothies as well. It’s low in calories, tastes good, and is easy to blend. A little pineapple, mango, banana, and romaine lettuce make for one delicious smoothie. This recipe calls for romaine lettuce, which is one of the healthier varieties of lettuce available. 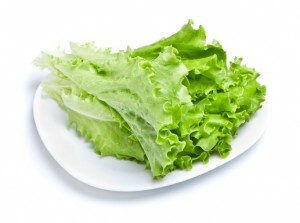 Romaine is especially high in vitamins A, K, C, and folate. It’s also a good source of dietary fiber and contains moderate amounts of manganese, potassium, and iron. The vitamins, minerals, and phytonutrients in romaine lettuce help prevent and alleviate a host of health problems. When selecting your lettuce, look for crisp, unwilted leaves that are free of any dark or slimy spots. Stick to organic and local when you can. Please leave a comment below if you try this tropical romaine lettuce green smoothie. Happy Blending! Made this tonight … the only thing I added were some flaxseeds. I’ll definitely be saving this one, it was great! Thanks for sharing. I find flaxseeds are a good add-on to most smoothies. Yum! I made this for lunch and was quite surprised. I started this smoothie diet based on your recommendation, 3xs a day for the 1st week, 2xs a day for the 2nd, and 1 a day going forward. So on the third day of week one, I looked in my fridge and said “What to do with this lettuce?, I don’t want it to go bad before I make a salad” I Google, Smoothie with romaine and there’s my guy again with a recipe. My personal additions was a tsp of agave nectar and 1 tsp of vanilla whey protein. I really enjoy this recipe!! It defiantly will be one of my favorites. I really love the ingredients of this smoothie but for some reason it tasted bitter so I added the juice of half an orange. This is the first time I use romaine in my smoothies, the bitterness surprised me. I usually use spinach & kale in my smoothies with great results, any feedback on using romaine in my smoothies? To combat the bitterness I would try using a little less romaine and/or adding in more sweet fruit like you did with orange juice. Typically romaine isn’t too bitter, although the bitterness is actually good for you. It comes from the alkaloids or plant medicines. Because the romaine can be tart it mixes really well with the tartness of the apple but the apple also sweetens it. I like your style, Jennifer. Your version of this recipe sounds delicious! I cut everything but the romaine in half if it is just for me.